The National Elevation Dataset (NED) is the primary elevation data product produced and distributed by the U.S. Geological Survey. The NED provides seamless raster elevation data of the conterminous United States, Alaska, Hawaii, U.S. island territories, Mexico, and Canada. The NED is derived from diverse source datasets that are processed to a specification with consistent resolutions, coordinate system, elevation units, and horizontal and vertical datums. The NED serves as the elevation layer of The National Map, and it provides basic elevation information for earth science studies and mapping applications in the United States and most of North America. An important part of supporting scientific and operational use of the NED is provision of thorough dataset documentation including data quality and accuracy metrics. The focus of this report is on the vertical accuracy of the NED and on comparison of the NED with other similar large-area elevation datasets, namely data from the Shuttle Radar Topography Mission (SRTM) and the Advanced Spaceborne Thermal Emission and Reflection Radiometer (ASTER). 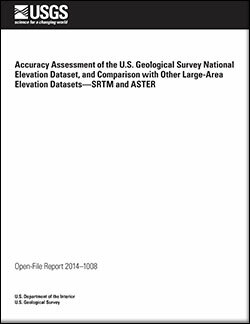 Gesch, D.B., Oimoen, M.J., and Evans, G.A., 2014, Accuracy assessment of the U.S. Geological Survey National Elevation Dataset, and comparison with other large-area elevation datasets—SRTM and ASTER: U.S. Geological Survey Open-File Report 2014–1008, 10 p., https://dx.doi.org/10.3133/ofr20141008.